In October 1950 Sadie Walton put an ad in the paper announcing a Quaker Meeting for Worship to meet at her and Harold’s home. The Cowgill sisters, Agnes Smith, Binnie and John Avery were among the first to respond. By 1953 there was a fledgling monthly Meeting for Business and it was meeting at the University Women’s Club as guests of regular attender Margaret Fritz. The budget for the year was $100 and there was no First Day school. On October 3, 1954 an installation meeting was held and we became a “proper” monthly meeting with 22 members and attenders (including the Averys, Throns and Waltons). The first official Clerk was Gladys Lindes, followed in 1955 by Wolf Thron. Committees included Ministry and Counsel, Peace and Service, Social, Adult Religious Education, First Day School, Family Camp and Publicity. The first set of queries for Boulder Meeting were written and adopted. In 1956 several other families joined and a First Day School was started in collaboration with the Unitarians. In 1957 an adult discussion group was started and there was a sewing group for AFSC service projects. In 1959 the bill permitting Friends’ marriages became law. During the 1950s meeting and First Day school moved several times, first to different homes and then to rented spaces. At the end of the decade the Meeting had 24 members over 16 years old, 17 members under 16, and 15 attenders. Photo of our meeting house. 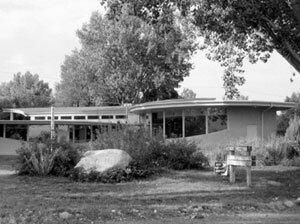 Early in 1960 after long and careful deliberation (and trepidation, considering the size and resources of the group) the Meeting for Business decided to buy the lot owned by Donald and Eloise Smith (later Ristad) on Upland Avenue and build a meeting house. A building committee was appointed with Jack Kraushaar as convener. Charles Haertling was hired as architect. His fee was so low that his service clearly was a personal contribution to the Meeting. The original footprint consisted of two pods, the meeting room (about half the size of the present one) and the First Day school room (some eastern Friends where rather put out by the unconventional shape of the building). A 10-year loan of $10,500 was obtained, and about 2000 hours of volunteer labor was put in by the Kraushaars, Throns, Waltons, Averys, Gottliebs, Micheners, Traibushes, Bakers, Smiths and a few others. In 1963 the Meeting incorporated as a non-profit organization. The five trustees who signed the document were Sarah Binnie) Avery, Jack Kraushaar, Sidney Ostrow, Wolfgang Thron and Harold Walton. There were 39 members over 16 and 51 children in First Day school (they sometimes met down the street at the Smith house). In 1964 a community outreach fund was established as a resource for witnessing concern for human needs. In 1965 we “adopted” the Carter family from Merigold, Mississippi. Their seven children integrated an all-white school and thus the parents had a difficult time getting employment. We continued their support until all children finished college in 1982. All during the early years there was concern about survival as a Meeting. There was a lot of turnover, people coming and leaving, and the core group was not very large. At times the number of children and Meeting house maintenance seemed overwhelming. In 1966 the Gottliebs moved to Carbondale and the Gottlieb lectures were established in appreciation of their contributions. In 1967 Iris and John Green started the Upland school in the current fellowship room (this school continued until June 1988). In the late 60s there was much concern with the Vietnam war, draft counseling (had ad in Camera offering information), and the treatment of “hippies.” The meeting was expanding and the building became very crowded. There was much soul searching about the financial feasibility and moral rightness of spending money on expanding it. But at the end of the decade a special Meeting for Business agreed to expand the Meeting house. During the summer of 1970 the meeting room was expanded by moving the northeast wall back, and a new wing, which became occupied by New Horizons school, was added. The addition cost $22,000. The money was loaned by meeting members and the building committee was headed by Arthur Bell. Our regular budget that year was $14,100. In the early 70s Meeting was concerned with draft counseling and the support of conscientious objectors as well as of the United Farmworkers. It helped organize a communication center on the Hill in response to anti Vietnam War riots, gave a substantial donation to help the People’s Clinic buy a building, and continued support of the Carter family. In 1974 there were so many members and attenders that we started the extended families to enhance community life. One of the original extended families survives to this date and many others have been started (while some have disappeared). We also affiliated with Intermountain Yearly Meeting that year. In 1976 we had 107 members and held a 25th anniversary celebration. The annual Fall Gatherings at the Powelsons’ cabin started. We sponsored the Santos family, a Chilean refugee family (Esteban was a political prisoner) to come and settle in Boulder (they still live in Boulder and their two older girls have graduated from college). In the late 70s Meeting was concerned with the Chilean situation and worked with Amnesty International; it also took part in demonstrations against nuclear arms, organizing walking and car caravans to Rocky Flats. We collected fabrics for a sewing project at the Pine Ridge Reservation and supported, with 10% of our budget, the purchase of emergency housing (which later became Echo House, where we continue to be responsible for one apartment). The budget these years was $14,000 – 16,000 and there was concern that at least half of it be always for outreach. The process to revise the 1955 queries started in 1978. In 1980 and 81 there were discussions on the quality of ministry, the new queries, and membership of children. Draft counseling continued; a letter was written to the Ayatollah Khomeny appealing for “love and respect of life”; the marches to Rocky Flats continued, and there was growing concern about American military aid to El Salvador and the returning of refugees. There was also concern about the overcrowding of the meeting room and possible annexation to the city. We held progressive dinners (with each course at a different home) and dinner discussion groups. In 1981 there were four weddings under the care of the Meeting! In 1982, trying to respond to the many peace concerns, the Meeting made a commitment to support a Friend in peace work. Friends pledged extra contributions to this end, increasing our budget to $37,000. Mary Hey became our Peace Secretary and served in that capacity until December 1987. These were years of intense involvement with issues of peace and justice. In November 1983 we started the peace vigil on the mall, every Friday at noon. It continued until June 1988. Several Friends were deeply involved with the Soviet Sister City Project as well as the Jalapa Sister City project and the building of the school there. We also held peace potlucks, discussion groups and program hours about peace themes. A Central American Concerns Group was formed: it raised money to bond out from the INS a Salvadoran refugee, contributed to the support of a refugee family in Denver, had numerous letter writing campaigns about the situation in Nicaragua, El Salvador and Guatemala. We procured a video camera to send to Nicaragua with Witness for Peace (it was used to good effect for three years and Brian Underhill made a video that was widely circulated). As the deportation of refugees escalated, after serious soul-searching the Meeting agreed to offer the Meeting house as sanctuary and support financially (in case of arrest) and spiritually Friends who were led to participate in the underground railroad. Eventually, the Meeting helped get papers and supported a family from El Salvador. The family lived with the Medruds for an extended period of time. This committee also started the support of Annunciation House (a border refuge) in El Paso and tried to organize nation-wide Quaker support for those working at the border. In 1984 the Meeting borrowed $20,000 to replace the roof. In 1986 we had 168 members and awareness of the lack of adequate space for First Day school and overcrowding in the meeting room prompted Friends to establish a Long Range Planning Committee to consider our alternatives (thus, the present Meeting house is the fruition of a 13-year process). In 1987 we lost our presiding clerk, Sadie Walton, to cancer. The same year the first Quaker Studies group started, using Philadelphia Yearly Meeting’s 26-week curriculum. This was followed by several other study groups, some of which continued to meet for many years. In 1988, after the Peace Secretary position was laid down, a Youth and Peace facilitator position was funded and filled by Raji Thron, working especially with the Senior Young Friends who were hoping for a trip to the Soviet Union and a visit to Boulder’s sister city, Dushanbe (while the trip did not materialize, the Senior Young Friends group became especially active and strongly bonded). In 1989 several threshing sessions were held regarding our building options and temporary classrooms were built in the fellowship room. The Meeting also got more actively involved in the Right Sharing of World Resources. We became especially spiritually united this year by the grief of the loss of Susan Boulding, Anne White and Maia Frantz within weeks of each other. In 1990 we started offering “Quakerism 101” classes (2-3 sessions of the basics). The IMYM/AFSC Joint Service Projects started, and grew over the years in both number and participation. The Youth & Peace coordinator position was transformed into a Religious Education coordinator for all of First Day school. The Persian Gulf situation deteriorated and silent vigils were resumed in November (held on Sunday afternoons). In January 1991, once again after deep soul-searching, the Meeting approved a minute offering sanctuary to military who refused to serve in the Gulf War. Jim H. was accepted in sanctuary and a sanctuary committee was very active until his situation resolved. In February 1991 the regular 8:30 Meeting for Worship started. The marriage minute, adopting “a single standard for all committed relationships that are under our care” was approved. We mourned the death of Ann Thron. In December 1992 the Long Range Planning committee was authorized to seek architectural help, exploring major building renovation. In June 1993 we started to interview architects. In 1993 we held a threshing session and wrote a minute on Colorado’s Amendment 2. We also started a Bible study group that met twice a month for two years, started “joys and sorrows”, and started twice-yearly potluck discussions sponsored by Ministry & Counsel. Over the years, there were discussions on Jesus, on “leading your worshipful life outside of Meeting” and on “conflict and the Quaker process,” among others. 1993 was again a year of several deaths: Betsy Moen, Kenneth Boulding and Adam Ristad. In 1994 the mid-week Meeting for Worship at United Ministries started, as well as the Tuesday night silent meditation. A threshing session on vocal ministry was held, a new Quaker Studies curriculum was started, another Quakerism 101 was offered, and participation in Meeting for Worship ranged between 65 and 100. There were also intense explorations of how to use/improve the Meeting house and a one-day workshop on “constructive conflict for building community.” In December the selection of architects was approved. In 1995 a threshing session was held on First Day school needs, and several more on values, needs and money regarding the building. The Meeting joined the neighborhood suit brought because of water contamination. In December, after many lengthy business meetings, it was approved to go ahead with a design phase for the building renovation with a cost cap of $500,000. In January 1996 we began the first Sunday program hour series on spiritual journeys that are still on-going. On third Sundays more outreach-type program hours continued. A set of three all-day workshops on racism and diversity were sponsored by the Peace and Social Justice Committee. There was a monthly support group for people who suffered loss. A potluck discussion explored starting our own Right Sharing project (which we now have at the Pine Ridge Reservation). The First Day school was strong and active with about 38 children (plus 12 in the nursery). In November the design phase for the renovation was completed and the cost estimate was $638,000. After considerable shock and discussion Business Meeting approved to go ahead. In 1997 Peace & Social Justice sponsored a potluck to discuss the Peace Testimony and sponsored a weekend-workshop on Alternatives to Violence training. Ministry & Counsel updated the Meeting’s marriage procedures. Our regular budget was $46,000. In January 1998 after a fond farewell to the “old” building, we moved to Crestview School. After approving another cost increase (to $750,000), going through annexation, and many other hurdles, the building renovation proceeded on track, thanks to the able help of Hy Brown. While in Crestview, we maintained our spiritual life with many deeply gathered Meetings for Worships, program hours, and study groups. We also continued, with many dedicated helpers, to have a strong First Day school and kept up our varied outreach activities (mittens & milk for North Korea, infant kits for Iraq, letter writing campaigns, Right Sharing project at Pine Ridge, cooking at the shelter, maintaining Echo House apartment, Adopt-a-Family, collecting for victims of the hurricane in Central America, and so on). In May 1999 we thankfully celebrated the return to our “home” and the incredible generosity of so many F(f)riends who gave large contributions of money and time, so that we could move into the Meeting house debt-free! In May we held worship sharing groups as we grieved for those involved in the Columbine School massacre and the war in Kosovo. A Peaceful Careers Project was started, offering alternatives during recruitment in the high schools and CU. A worship-sharing group on the Bible and Quaker writings was started and Ministry and Counsel organized a potluck discussion on prayer. Friends cooked and served at the homeless shelter. Boulder Friends Meeting started the century with 161 members (about 70 non-residents offset by as many attenders) and a $52,000 budget. In the early 2000s searching for responses to the 9/11 tragedy guided us to worship sharing gatherings, finding contacts with Muslims, participating in interfaith events, and starting again to hold a silent peace vigil every Sunday. The Meeting also supported the work in Guatemala of a released Friend from Mountain View Meeting, participated in the IMYM-AFSC Joint Service Project, with some Friends spending time in the summer at Pine Ridge Reservation helping with building projects and running an art program at Loneman School. Joined Palo Alto’s El Salvador Program and collected books for children and started to contribute two scholarships to attend university for two peasant students. We continued to provide scholarships through the decade. Peace & Social Justice Committee also continued the Peaceful Careers Project. Friends cooked and served at the Homeless Shelter and supported Unit #3 of Echo House, repairing and painting the unit and providing household supplies. First Day School attendance averaged between 30 and 50 children (including child care). A new enlarged curriculum included themes as the Light Within, Quaker history and other religions today, stewardship of the earth, equality, service and personal responsibility. The children also participated in outreach projects, such as the Crop Walk. In potluck discussions we explored the many forms of Quaker ministry, and the peace testimony in our lives. Starting in 2003 the war in Iraq occupied Friends who participated in marches, rallies, meetings with legislators and acts of non-violent disobedience. The Peace and Social Justice committee also collaborated with the Interfaith Leaders for Non-violence. With Meeting volunteers in attendance, overflow homeless persons slept at the meetinghouse once a week. We participated, in cooperation with other meetings, in writing a Faith & Practice for InterMountain Yearly Meeting, which was adopted by IMYM and published in 2009. Meeting mourned the deaths of Mary Sheidler McDermott and Pat Smith (2000), Myra Jo Dryer and Wolfgang Thron (2001), Kay Dugan, Harold Walton, and Binnie Avery (2002), Barbara Reinhardt (2003). In the mid 2000s we tried to organize our outreach in larger umbrella-categories, such as Boulder Friends projects, local organizations, militarism, Latin America, and Quaker organizations. We continued to raise money for AFSC through the grocery coupons. The role of the US government in practicing and promoting torture weighed heavily on our mind. Friend Joanne Cowan felt led to cross the line at the School of Americas and go to prison. Recognizing the truth of her leading, the Meeting endeavored to support her. Responding to another leading, the Meeting sponsored two Sudanese “lost girls” in moving from the refugee camp in Kenya to Boulder. The support of the Homeless Shelter, Emergency Family Assistance, and Echo House also continued. The Meeting supported Carriage House, a day shelter for the homeless, both monetarily and through the work of one of our members. A few dedicated Friends kept the art project at Pine Ridge Reservation alive. First Day classes continued strong, despite the challenges posed by the irregularity of individual children’s attendance. The Religious Education Committee offered a series of children’s meetings for worship and classes on the mystery of silence. Workshops on non-adversarial communication and on Quaker work in prisons were held, as well as a five-part series to help each other understand better the historical and modern issues surrounding fundamentalism in many religions. The Roaring Fork worship group was formed in Carbondale, under Boulder Meeting’s care. Friends endeavored to visit the worship group once a month, weather permitting. To better fulfill their mission, the Ministry and Counsel Committee divided into Ministry & Worship and Oversight & Membership Committees. Friends Ruth Correll (2005), Gilbert White (2006) died. In the later 2000s we focused on learning more about racism and the immigration issue, in the context of the larger theme of taking away the occasions of war. We also learnt about the current legal issues in Indian country. Meeting provided material and social support for the two Sudanese refugees we sponsored and the International Service Committee organized informative fundraisers on their behalf. Many of our local activities focused around the homeless of Boulder. First Day school was active exploring what they believed, learning about bullying and friendship, and about Bible stories through music and art. The summer program of “learning from Animals” was a great success. The children continued to be involved in outreach to the larger community, collecting toiletries for EFAA and preparing sack lunches for the homeless. Meeting is seeking ways to involve the older children with the younger ones, as well for the adults to get to know the Meeting’s children better and find ways to better connect First Day School and the adult Meeting. Candlelight worship and caroling on Christmas Eves were a welcome addition to the Meeting’s life, as were worship sharing opportunitieson what it means to be a Quaker and what worship and devotion means to us. We sought activities that invite the participation of the Meeting as a whole and held a meeting-wide picnic. Our original by-laws were revised with the assistance of an attorney to comply with current government requirements and still accurately reflect the peculiar structure and ways of Friends meetings. In 2010 we installed a solar photovoltaic system to provide a portion of our energy. We mourned the death of Tom Mayer (2008), Richard Counihan and Jack Powelson (2009), and Cindy Troxell (2010). Throughout the decade Friends continued to share their spiritual journeys on first Sundays, enriching our knowledge of each other. Eight-week programs exploring many aspects of Quaker faith and practice were held at about 18-months intervals. Semiannual Colorado regional meetings and Colorado women retreats were held, “extended families” were formed or continued to meet, and potluck discussions on Quaker and spiritual issues were held. These activities contributed to bind together our many and diverse people into a community. The Building & Grounds Committee worked diligently to maintain the meetinghouse and its grounds, with some Friends of all ages joining in on spring and fall clean-up days. The Fellowship Committee provided coffee and tea for the after-meeting fellowship and organized three yearly potlucks (Christmas, Valentine’s Day and Easter). As the decade ends, we are exploring how we live the testimony of simplicity and ask ourselves whether we have too many committees, are too fragmented, and too busy. As of December 31st we have 147 members. While 44 new Friends joined the Meeting, many inactive members upon being contacted, withdrew their membership. We have around 40 attenders at every meeting for worship. The Meeting’s budget for the current fiscal year is $78,866. The Meeting is strong and vital, and we are grateful for the spiritual growth and hard work of so many Friends and attenders.